Mailinglists are a great possibility to create online communities. However, we often saw fellow students struggle with this idea. Here is a (hopefully) simple explanation. A neighbor, Jack, moved away – thus the mails are not useful for Jack anymore. Catherine needs to delete him from her list. If she does not know he moved, she keeps him on the address list and he will continue to get useless mails. A new neighbor, Jenny, moved into Jacks former flat. She would love to ask for some tools for setting up everything. But Catherine has to give Jenny a list with the mail addresses of all neighbors to make that possible. But they don’t know each other yet. So, the address list needs to be maintained, people can’t sign themselves out or in. 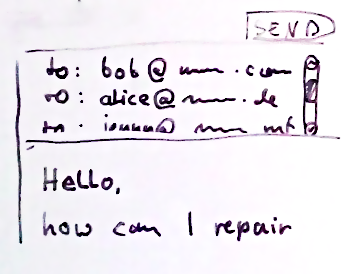 2) an list of addresses saved on an computer (a »server«). This list is similar to the list Catherine had. But before, every neighbor needed to maintain a similar list. Now it is just one list, stored on that server. 3) Aside of receiving mails from anybody the server can send mails to anybody too. Because of this it can re-send a mail which you send to neighbours@example.com to anyone on the list. 4) In addition the server provides a sign-up and a sign-out function: There is a webpage for signing up and adding your address to the list and one on which you can remove your list again. So new neighbors just need to get a link to that page and neighbors who move away can have their mail removed again. Thus you can use eMails like a facebook group or a web forum, but without the need for an additional login or the need to go to a specific website, just by using your mailclient or webmail. You are currently viewing the archives for April, 2015 at maschinenraum.